Home » How-to » What is Android Media Server & What Does Media Server Do? What is Android Media Server & What Does Media Server Do? Now a days where there is an era of smart phones, maximum number of individuals are using Android phones in their day to day life, weather it comes to be the part of Business or Personal use. When the technology is getting increased in day to day life, where we are getting dependent on the technology wishing that how the technology will be making our life much more simpler, As the invention of mobile phones was one of the best invention that has involves in the every person day life thoroughly, As there are two most used operating system of the Smartphone one is Android, and other is iPhone, though Blackberry is also in the market but not getting a good result in comparing with these two operating system, When there is a maximum users of Android users so there will be a probability of getting the Pros and Cons of the device in the market very easily. The basic things when which comes around is the battery drainage problems which always comes in the general Cons, due to which some people don’t like to use Android. But when we give a brief about the problem that why the problems come? Have we ever thought about that? Why It Happens? This all problems comes due to the Android Media Server, As Android Media Server Service comprises in all the smart devices, the media server is a server which is used to scan all the media files of the devices, the media files includes Images, Videos, Music file, and much more. It is said that when the media server have scanned the media related files, the its no need to scanning of the media files. Due to which you can easily access the media files when you need that. So, it can be said that when the media server is added to the device which results in the reducing the disk Input and Output. It is also useful for a Android device operator to get a faster response, as it should be the one of the reasons for the fast battery draining problem of the Android device. As the battery power consumption is used more by the media server. Firstly, we have to go to settings part of your android powered device. Then you can check the section Device there you can find a tab of Battery, Just click over it to check that how much percentage of battery is getting used and where. 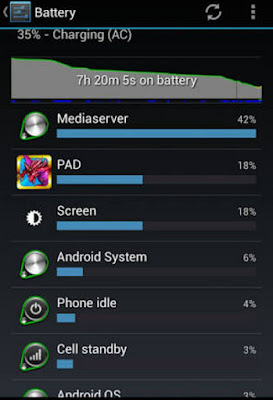 Thus, the battery drainage system is the major problem which is coming in front of an Android user. Now, we can come over a brief of Media servers, as media servers refers as a device that stores and shares media, it can also be an appliance which includes the combination of both and hardware and software to offer the audio visual content over the Wi-Fi network. As persons are always finding the way to get rid of this issue, due to which there Battery gets easily drained, which create a lot of problems in the daily usage of the phone, due to which there work sometimes get stopped due to non-usage of the phone. connectivity, so the first point we should consider is that we should delete the unwanted files from the storage of the device, it have to be deleted from both the memory internal as well as external too, if it gets noticed that there are many files that contains the SD card there are many files which comes in the card while we are using the Internet, the media files get saved there, that gets automatically downloaded from the web pages, that also increase the media file of the device. After following the above step, if the problem still get faced then there is a time to change the micro SD card with the new one along with a more capacity, it may also help in resolve the issue. Now a days there are many app coming in the Store that can also help us to get relief from the problems, i.e. to Kill the unnecessary media file from the device, One which is popular and is useful is to be Media Server Killer that can help better in solving the issues, that is available in the Google Play store. As here, in the discussion where we have discussed about the Android Media Server in brief, we have also look what does the android media server do, in terms of the additional details we have also focus on the solutions how to fix the problems coming due to Android media Server. So if the above process is followed very carefully then there can be less problems incurred in your android device that will also help in the long life of the Android device.